As Steph Houghton and her Manchester City team-mates step up to lift the Women's League Cup, we'll bid you farewell. You can read Tom's match report from Bramall Lane by clicking the link below. Congratulations to Nick Cushing and his team. Thanks for joining us, we'll see you soon. 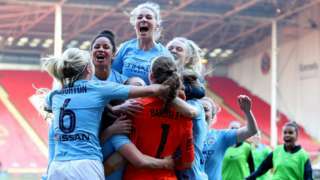 Manchester City win the Women's League Cup for the third time, beating Arsenal in a penalty shootout at Bramall Lane. This is quite brilliant, yet bizarre and unusual. There are car tyres on the pitch, as the sponsors prepare for the trophy presentation. Yes, tyres. For what it's worth, Man City's road to this final began with a goalless draw at Birmingham in the group stage in August, which they also settled with victory on penalties. 'Blue Moon' blasts out on the PA.
We love this trophy and we were disappointed with our performance in the final last year. You're obviously nervous, but I'm thankful that we won and I'm looking forward to lifting the trophy. We've got to push for two more now. That was awesome. I thought the girls were lights out for 90-plus minutes and I'm really proud of the performance. We were a little unlucky hitting the woodwork a couple of times. But this is a goalkeeper's dream - in a penalty situation there's no pressure on us, so it was pretty fun. Manchester City win the League Cup for the third time, avenging last year's defeat by Arsenal. This could be the first step towards a domestic treble, with the Women's Super League and FA Cup both still up for grabs. The City players gather in the middle of the pitch, dancing and celebrating. The Manchester City players rush towards Canada international Janine Beckie, who wheels away to celebrate with goalkeeper Karen Bardsley. Well played, City. They deserved it over the 120 minutes and they've done the business in the penalty shootout. Janine Beckie scores! Manchester City are the 2019 League Cup winners! England captain Steph Houghton drills her effort into the bottom corner. Advantage Manchester City. Another save from Karen Bardsley! Danielle van de Donk can't beat the England stopper from 12 yards. Claire Emslie, brought on with one minute to go specifically to take a penalty, finds the bottom corner. But Leah Williamson also has her penalty saved to keep the score level! It's a good save from her England team-mate Karen Bardsley, diving to her right. Sari van Veenendaal has been the star for Arsenal today and the Gunners goalkeeper saves Lauren Hemp's penalty! Scotland international Kim Little opens up her body and strokes it into the corner. Good penalty, that. We're all square. Georgia Stanway strikes her spot kick low and hard to the goalkeeper's right. Manchester City score. Can Arsenal win the League Cup for a record sixth time? Will Manchester City lift the trophy for the third time in five years?